GRANT ME ONE LAST WISH!!! 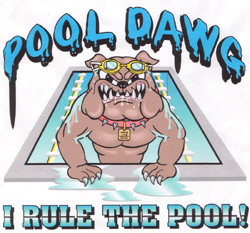 This shirt is a MUST for every swimmer that attends swim meets! What a GREAT GIFT!! This royal blue graphic is on a 100% cotton white shirt. The graphic is on the front. This shirt is whtie with dark green lettering in 100% cotton. This print is on the front. This multiple print shirt is printed on the fron of a white 100% cotton preshrunk tee. 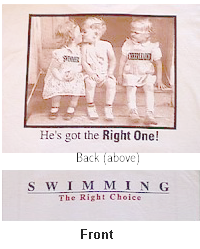 This shirt has a 2 color print on the front chest saying "SWIMMING"
On the back it has the picture and wording shown. The shirt is white and print is a sepia tone brown.